POSCO pursues 'Corporate Citizenship: Building a Better Future Together'. POSCO will become a valued member of society, grow alongside various stakeholders, such as employees, shareholders, customers, suppliers, vendors and local communities, and pursue the values of consideration, coexistence and symbiosis. 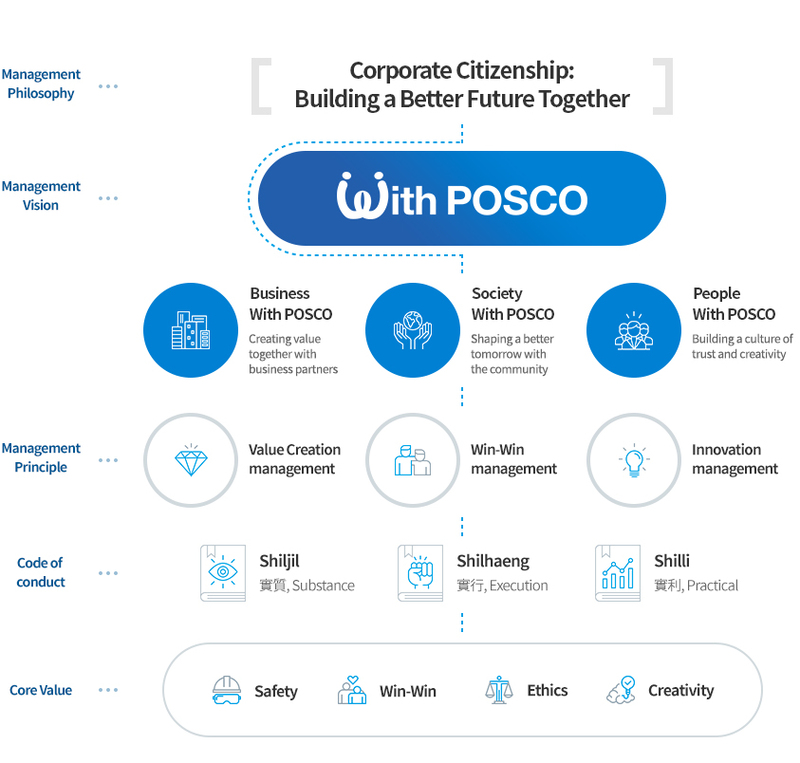 POSCO made 'With POSCO' its vision, and it is building a better future with 'Business With POSCO', by creating values with business partners, 'Society With POSCO', by shaping a better tomorrow with the community, and 'People With POSCO', by building a culture of trust and creativity. POSCO takes great efforts to realize the values it deems important, such as putting substance first, emphasizing execution, and pursuing benefits. It achieves value management, win-win management and innovative management by putting substance before form, placing more emphasis on execution than on reporting, and pursuing substance rather than justification. POSCO's Core Values are 'Safety,' 'Win-Win,' 'Ethics' and 'Creativity.' 'Safety' means that utmost priority is given to respect for people, and position holders should take the lead in encouraging routine safe behavior with a focus on actions. 'Win-Win' means to practice having consideration for and sharing with others, pursue mutual prosperity, and continuously grow by creating social values. 'Ethics' means to seek ethical behavior based on the mutual trust between members of society and abide by the principle of reward and punishment. 'Creativity' means to take the lead in solving problems by cooperating openly with an open mind. Copyright © 2011 POSCO Japan PC CO.,LTD.All Rights Reserved.